Add this shop to my favorites. Mauretania, Numidia, Gaetulia - Basire c. Availability: in stock Condition : Very good, minor defects. 1750 Overall size : 37 x 24 cm. Image size : 30 x 20 cm. 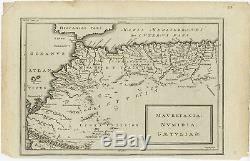 Description: Antique map Africa titled'Mauretania, Numidia, Gaetulia & c. Rare map of North Africa depicting Numidia, Libia and Morocco. Artists and Engravers: Engraved by I. The item "Mauretania, Numidia, Gaetulia Basire (c.
1750)" is in sale since Friday, November 2, 2018. This item is in the category "Antiques\Maps, Atlases & Globes\Africa Maps". The seller is "bartele-gallery" and is located in Langweer. This item can be shipped worldwide.